There is a multitude of possibilities. 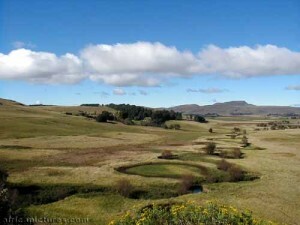 Zululand: One option is to overnight in a remote Zulu village, where you will get a close up experience of village life. You may walk in the Drakensberg mountains, visit the unique St. Lucia wetlands, or do several days of hiking along the famous Otter Trail, so popular that people from all over the world accept to be waitlisted for a year, or more. Honeymoon in South Africa. Or, if you so wish, do the entire wedding at an exclusive lodge, with its own chapel for the ceremony. Supremely romantic! We are happy to take care of all arrangements. For rail enthusiasts: Luxury on board the Blue Train or Rovos Rail. We will undertake all kinds of arrangements, from a short trip just to Cape Town to round trips throughout Southern Africa for months, if you wish. A4U caters for individuals, couples and larger groups.